The differences and similarities between certification and ratings programs are not well understood by the market. As our programs – and the sustainable seafood landscape – evolve, defining and communicating our complementary roles is key to having greater impact. Certification and ratings programs have a common goal of encouraging fisheries and aquaculture to undertake continuous improvement toward environmental sustainability, social responsibility, and economic viability. Our programs play complementary roles to drive improvement and meet a range of market needs for stakeholders including producers, businesses, governments, and NGOs. Ratings focus on assessing as many seafood sources as possible in key markets to provide information on the full spectrum of low-to-high performance for fisheries and aquaculture. This information can be used to identify opportunities for producers to pursue improvement projects and certifications, as well as help businesses evaluate sourcing options. Certifications directly engage with fisheries or farms and require them to address social and environmental challenges to improve and meet the certification standard. Certifications also engage with the supply chain to verify the sustainability or responsibility and origin of certified products. 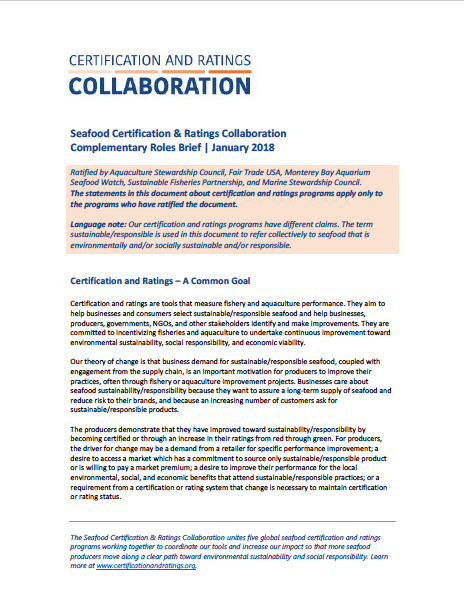 Together, our certification and ratings programs offer a range of tools to assess seafood performance and support different responsible sourcing strategies. To learn more, please download the full brief, and the slides that we use in buyer meetings, below.